With the Christmas season approaching, I'm thinking quite a bit about the holidays right now. This year, we're not going away for Christmas, instead, my parents are coming to stay with us. Can't say I mind not having to travel by plane right around Christmas and New Years! I'm a bit of a traditionalist when it comes to where I'd like to spend Christmas: at home, with family us my preferred spot. But in recent years I have occasionally considered other options, and here are some places I wouldn't mind celebrating Christmas. About to go dashing through the snow, in a one-horse open sleigh. This is a bit of a cheat, because we have already celebrated Christmas here several times. I was born and grew up in Sweden, and when we do travel for the Christmas holidays, this is where we go: to my parents' place in northern Sweden. 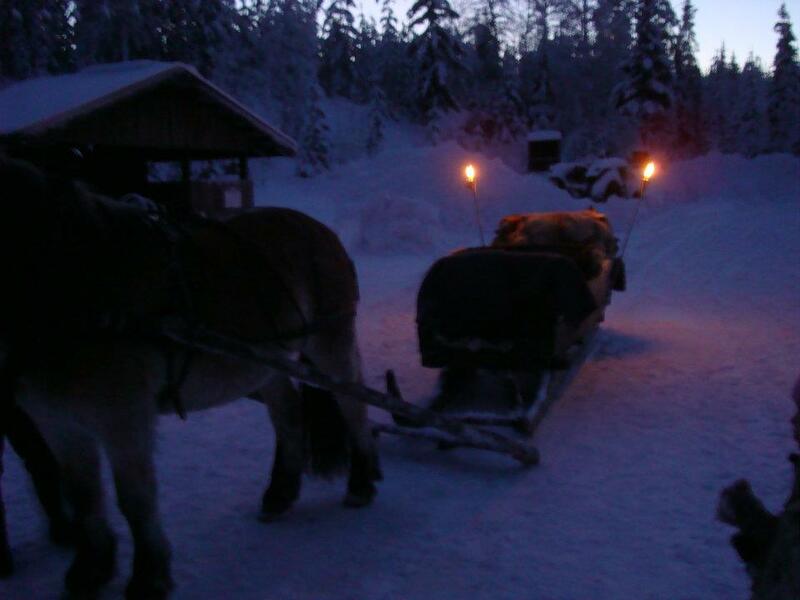 It is a great place for traditional Christmas celebrations though: snow is usually in place, it's cold, and there are a lot of nice Swedish traditions to experience. Last year on our Swedish Christmas-trip we went for a sleigh-ride in the snow, we went tobogganing, the kids tried out cross-country skiing, and we had lots of delicious gingerbread cookies, peppermint candy, glögg (Swedish mulled wine), and the kids got their presents on the evening of December 24th, since that's the tradition over there. I love, love, love Maui. I would go back there every week if I only could afford it. In the past I haven't been too crazy about the idea of celebrating Christmas somewhere warm and sunny and without any chance of snow, but I would actually love to try this in Maui. At least once! For a traditionally snowy and cold Christmas, Finland is a pretty sure bet. And going to the Santa Claus village constructed in Rovaniemi at the Arctic Circle, would definitely be a lot of fun with the kids. Celebrating Christmas in Australia would of course mean celebrating it in the middle of summer in the southern hemisphere. And that's kind of the charm of it, right? To see the world from the other side, see the starry Christmas skies with all different stars than at home, and go to the beach instead of for a sleigh-ride. The Canadian Rockies is a spectacular destination any time of the year, but I do think that it would be really special to celebrate Christmas up there. The slopes certainly add to the attraction: there are worse ways to spend Christmas morning than going for some skiing down a mountain. Gran Canaria: there are worse places to spend Christmas, I'm sure! My family visited Gran Canaria last year in the spring, staying in the town of Arguinegin, and it was a fantastic trip. For many Europeans, going to the Canary Islands is nothing all that special: it's like Canadians and Americans going to Mexico for some beaches and sunshine. But if you're coming all the way from North America, it certainly felt very special. Parts of the islands are too touristified to really appeal to me, but the place we stayed was fantastic. I definitely would not mind going back there for some Christmas cheer. I have never been to New York City, but of course I have seen the city in so many movies and TV-shows that I feel strangely familiar with the place anyway. Not sure if Christmas-time is necessarily the best time to visit, but in my head I have this vision of gentle snowfall, sightseeing with the kids, and just a good time had by all as we explore the city. Christmas-fantasy? Probably, but I wouldn't mind giving it a try in real life.